1961 / Color / 2:35 flat letterbox / 80m. Roger Corman's second Edgar Allan Poe adaptation is a big improvement on his first, House of Usher, yet doesn't follow through on some production aspects. Before Corman, Poe had been tapped only for short subjects and the occasional art feature, as with the silent Fall of the House of Usher -- Savant doesn't count the Universal Black Cat and The Raven as real Poe features. Remembered as a first-rate chiller by every kid who saw it, Pit and the Pendulum upped the ante for frantic action and potential grue and provided a second opportunity to see the genre's Queen of Horror, Barbara Steele. Francis Barnard (John Kerr) journeys to Spain to hear for himself what became of his sister Elizabeth (Barbara Steele). In the castello Medina he finds her melancholy widower Don Nicholas (Vincent Price) lamenting her death from a blood disease. Satisfied by the report of Doctor Leon (Anthony Carbone) that Elizabeth's death was natural, Francis is considering taking his leave when Don Nicholas begins to exhibit strange behaviors. Seeing and hearing the ghost of Elizabeth, the trembling Don becomes convinced that she was buried alive and that a curse has befallen him as the son of one of the Inquisition's most notorious torturers. 1960's House of Usher was a compact and effective chiller that had made good use of claustrophobic sets and the morose characterization of Vincent Price. Darkly toned and wielding an effective stereophonic score, it fulfilled the 'haunted house' promise so many other spook shows did not: When the young lovers visited the crypt, the eerie music (with spectral voices, yet) created a mood that actually raised goosebumps. Thanks to an efficient screenplay by Richard Matheson, Pit and the Pendulum also delivers what so many haunted house movies do not, ominous threats that actually lead to frightening scenes. Add to that a conclusion that doesn't use a big fire to wrap up the loose ends, and story-wise, Pit is a winner. The casting of Barbara Steele shows well that A.I.P. were duly impressed with her genre debut in the previous year's Black Sunday. She doesn't disappoint, swooning and smirking around the torture chamber. There's one shot of her face that looks so cat-like, it's uncanny. And those eyes that appear so huge? It's because they're mounted in an unusally delicate and petite face. Vincent Price's Don Medina is a much more animated than his Roderick Usher, and is often charged with overacting, an unfair judgment leveled at Price in many of these films. His overwrought scenery-chewing is correctly styled for the material; when Corman's camera rises to Price's level of delirium, these films take wing. In Pit this happens more than half of the time. A flashback structure is used to present Don Medina's idealized view of his lost Elizabeth. Her eventual appearance in the flesh is all the more surprising when she's revealed to be quite a different person than the angel of Medina's memories. The doctor's concern, and that of Roderick's sister Catherine (played by Corman favorite Luana Anders) help flesh out the middle. But as soon as the third act lurches into motion, with the giant blade in the hell-pit cranked up and clanking away, we're transported by a horror machine with a unique 'deadline' device. The pendulum blade ratchets downward with each swing, digging closer to its victim's belly with every swishing arc. Don Medina seems truly insane in these scenes, and the Corman/Matheson ending holds a 'kicker' shock tag in reserve, one that has taken generations of audiences by surprise. On the disappointing side, in only his second Poe production Corman has already slipped into formula mode. The same halls and rooms are re-dressed to portray the castle in at least four of these pictures, and the general lighting scheme has backed off somewhat -- Pit just isn't very carefully lit. Like the twisty red candles that pop up again and again (Corman apparently bought a gross and used them for five years), too much of the production looks hand-me-down. The atmospheric matte paintings have also seen so much over-use that their original effectiveness in this film has been diluted as well. The saddest aspect is the musical score, which much of the time plays like random noodling. It pretty much goes nowhere in the terrific climax when something, anything more emphatic and 'tracked' would have sent the tension through the roof. The score in Usher had been a major plus, but the limp music here just takes away from the already-strained Spanish atmosphere. Of the Corman/Poe adaptations, Savant would rank them in this order: The Tomb of Ligeia, House of Usher, Masque of the Red Death, Pit and the Pendulum, Premature Burial, The Haunted Palace, and Tales of Terror.The Raven is very much a comedy and belongs in a side category with The Comedy of Terrors. MGM's earlier Tales of Terror DVD had slightly zoomboxed its image, ending up with a much tighter picture than the letterboxed Image laserdisc. 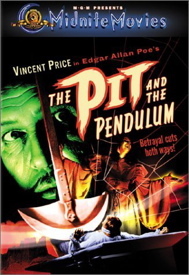 This new DVD of Pit and the Pendulum is not 16:9 enhanced, but does improve on the framing of its laser version. The DVD is a smidge tighter on the top (not enough to cramp the headroom), but adds substantial picture on the left and the bottom. On the laser, when Price shows John Kerr the portrait of his torturer father, all we see are the eyes, nose and mustache. On the DVD Don Sebastian gains a mouth. The color and contrast are also better on the DVD; by comparison, the Image laser looks like it was shot through a blue-gray filter and comes off rather flatly. The Tales of Terror DVD had included dream visions inexplicably missing their color tints; Pit's original color scheme is intact. Neither the DVD nor the laser has very good sound but the DVD cleans up some surface noise and so has a slight edge. The music still sounds a bit lower than it should. As an extra, the disc provides adds a foolish prologue sequence to pad the film out for television showings. In it Catherine Medina has become the inmate of an insane asylum. The color on this TV prologue sequence (irritatingly mislabeled as a "theatrical prologue") is very pale. The effective trailer is narrated by an appropriately theatrical Paul Frees, who calls Vincent Price the "master of the macabre" during a goofy shot of Don Medina giggling with hammy delight -- he looks more like the master of mirth and merriment! 1. Savant associate Gary Teetzel made a substantial contribution to the evaluation part of this review.